If you boil or steam peeled potatoes, don't throw out the water! Potato water is so handy and can be used for so many things - even cleaning stainless steel! It's full of nutrients, which means it's good for you, so use it. I use it instead of milk in mashed potatoes, it makes them light and fluffy. I also add it to stock to make soup, or to make gravy. It's good for thinning a pasta sauce too. You can use it in baking, especially breads (it is especially good in cornbread), to replace some or all of the milk. 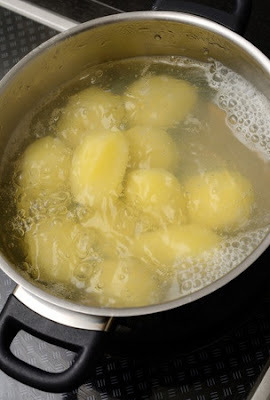 If you boil peeled potatoes for any reason, don't pour the water down the drain. It's chock full of nutrients and potato starch, which means it's good food. If you find you can't use it in cooking, use it to clean your stainless steel cooktop or fridge or pots and pans. Just dip a cloth in the potato water and wipe it over the stainless steel then buff with a soft, dry cloth. Potato water will keep in the fridge for a two to three days before it starts to get slimy. It will freeze, and be perfectly fine to consume when thawed but it will go grey and look horribly unappetising so I don't recommend freezing. And, if after all those ideas, you still haven't used your potato water up, use it to water you pot plants. They'll love the moisture and the nutrient boost.